One of the initiators of Rio in 1992, Jose Luzenberger (1926-2002), met with us in Bonn, Germany in April 1996. He decided on a walking meeting through the botanic gardens in Bonn and a visit to the museum of geology. Jose was trying to broker a deal on behalf of Seed Savers for the translation and publication of The Seed Savers’ Handbook with a Brazilian publisher. Lutz told us that he quit his high-powered job marketing pesticides for BASF when he visited a French apple farmer who was spaying excessive amount of their insecticides without protection. Worried that the side effects of pesticides were unmonitored during production and usage, he changed direction completely, moving back to Brazil where he was at the centre of every major environmental battles: from the pollution of rivers to the protection of the territories of tribal Amazon Yanomamis. “As an agronomist, interested in healthy, clean, sustainable agriculture, Lutzenberger went into sanitary engineering. He was also involved in recycling, being conscious that hundreds of millions of hectares of good agricultural land were being degraded by the destruction of humus and soil life, while on the other hand, in industry, hundreds of millions of tons of precious organic wastes were being destroyed by dumping, contamination or burning. He developed simple, alternative methods for re-use – either as fodder or fertiliser – of the wastes of many industries such as pulp mills, tanneries, slaughterhouses and food processing plants. He also worked in landscaping and gardening. As of mid July 2014 it has become possible to stay at Seed Savers in an artistically renovated garden apartment that is within the Fantons’ brick residence. Situated just two km south of the centre of Byron Bay and 600m through the Arakwal National Park from Tallow Beach and a creek mouth, the Seed Gardens are iconic for plant lovers. Thousands of visitors, hundreds of conference and course participants and dozens of interns have drawn inspiration, skills and knowledge from them. Now the gardens are not open to the public but a tranquil retreat. The one acre gardens are a fresh oasis, shady, cool and green in summer with ocean breezes but naturally warm in winter. 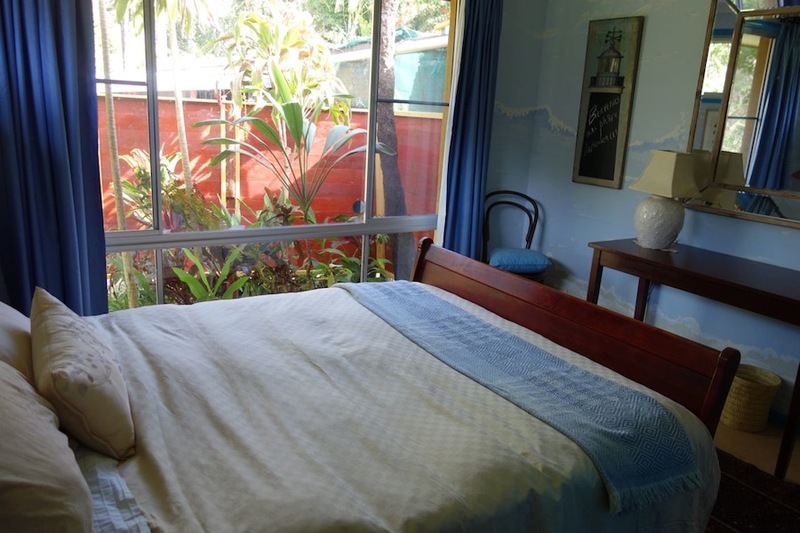 You are in a garden paradise with deep views into bushland across a disused railway line. 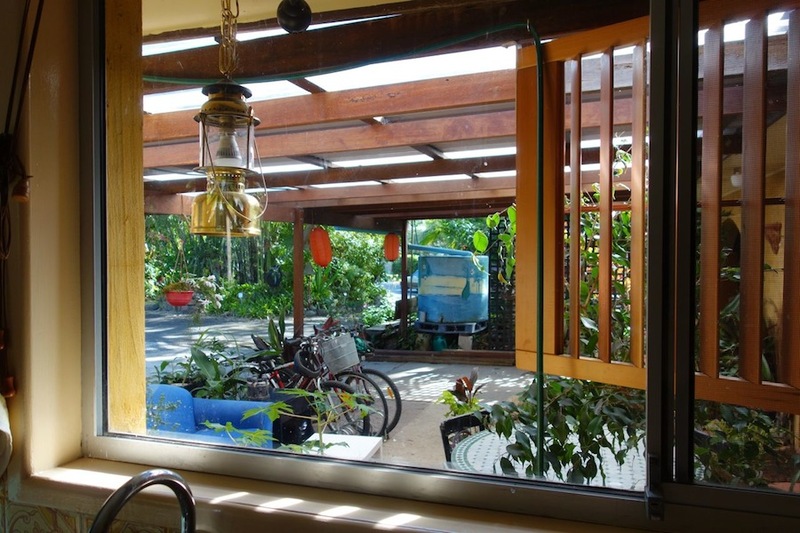 Designed in 1998 on Permaculture principles, the property has many elements that enhance life in the dwelling, such as judicious plantings to increase ventilation in summer and heat in winter. The garden has over one thousand useful plants, including vegetables, fruit and nut trees, spices, fibre and timber trees. The apartment has an arty, bright French country-style kitchen; a private access; one bedroom with a double bed, the other with two single beds; blue and white Greek-style toilet and also bathroom, which has a shower and a bath. There is small laundry with a modern front loader just outside that is available for your use. We have made deeply ecological choices when renovating, such as Marmoleum floor coverings (linseed oil, clay, pine flour and jute). The bedrooms are decorated with paint made of milk casein, marble flour and natural pigments. The kitchen is decorated with citrus oil paint. Hot water is from solar power, though there is an electric booster. If Michel and Jude are not away, they will show you over the gardens and harvest produce for preparation. Herbs and spices may be harvested from the garden for your use. Stays are for a minimum of three days and maximum of ten. Use our Contact Us facility to apply. 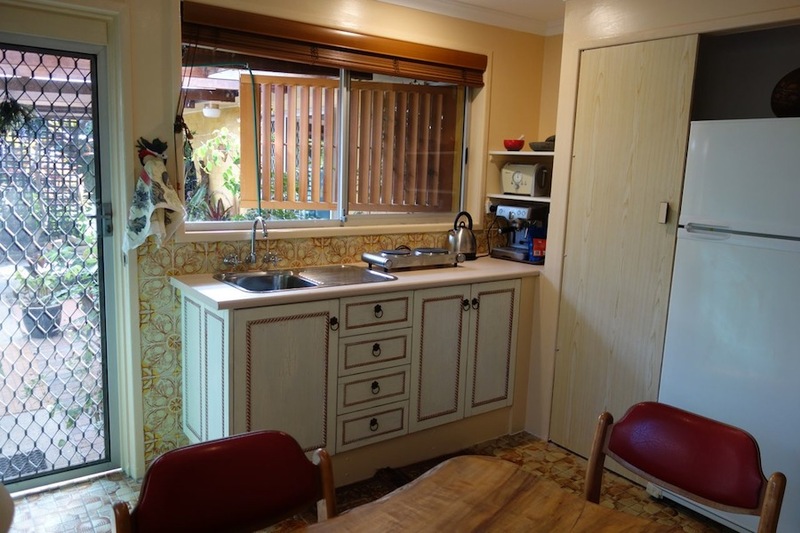 French country kitchen with two burner electric stove, toaster, expresso machine, small oven in cupboard, medium sized fridge. View from kitchen over courtyard to entrance along 45m driveway. 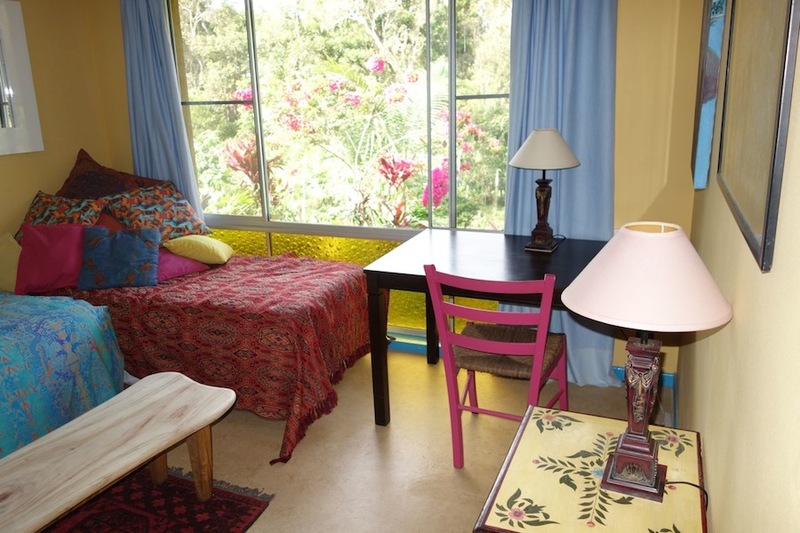 The yellow room has two single beds set up as daybeds and a view over flower, spice, vegetable and fruit gardens with bushland as a background. The blue room has a marine decor featuring lighthouses, waves and shells. She died off Malaria living a day walk from a clinic. She left two young children and a husband.She traveled by food and canoes to different village clinics who centralised the banana suckers and kept for Dorothy. She also travelled by foot to make made a collection of highland varieties in her village. She learned how to describe the varieties and kept records. Her vocational vocational school was also a duplication site in the isolated place called Manivovo girl training centre. we met Dorothy when she was an intern student at the kastom garden association in Honiara Solomon islands. The collection was part of a grant that seed savers distributed to small biodiversity projects. Dorothy we are missing you! The practice of sharing seeds as as old as humanity. Now branded a grand Open Source, the seeds are an example of how far we have gone into believing that seeds can be the patented property of some corporation. In India, Anadana or “gift of seed or the gift of food, is fully part of the vedic culture. People have survived better because they have shared seeds mosly to mix with their landraces or varieties of grain, vegetables, legumes to make them stronger. Please share you seeds with local seed network on this page. 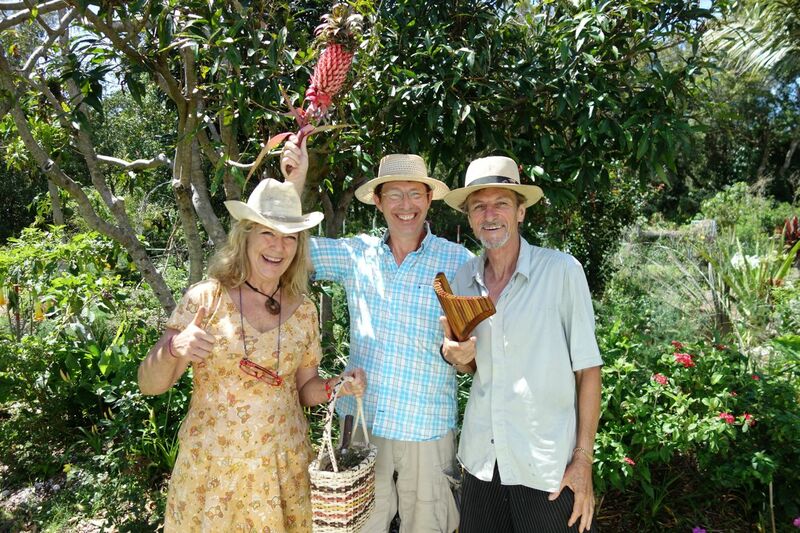 Aug 9th 2014: on ABC TV Gardening Australia”A SeedSavers retrospective” with Jerry CW, long time friend & board member. Can be seen anytime on ABC IView, video on demand. Jerry is very personal to anyone he meets and forever answers all sorts of personal and gardening questions. 3 Re-investing knowledge and skills By re-investing my knowledge and skills using my spare time, money and energy I aim to support sustainability through the stewardship of the Earth and care of humanity, to build capacity, and to enable others to follow suit, thereby strengthening these two ethics within and between the horticultural and conservation communities. As an executive member of Queensland Conservation, I have helped initiate the &lsquo;Grow Local&rsquo; community project aimed at sound nutrition, local employment, farmland conservation, and transition past peak oil. Through QC I sit on the Queensland Sustainable Agriculture committee, and the Brisbane City Council &lsquo;City Smart&rsquo; committee, and I have been actively advocating the inclusion of Soil Carbon Sequestration in the federal government&rsquo;s Carbon Trading Scheme. 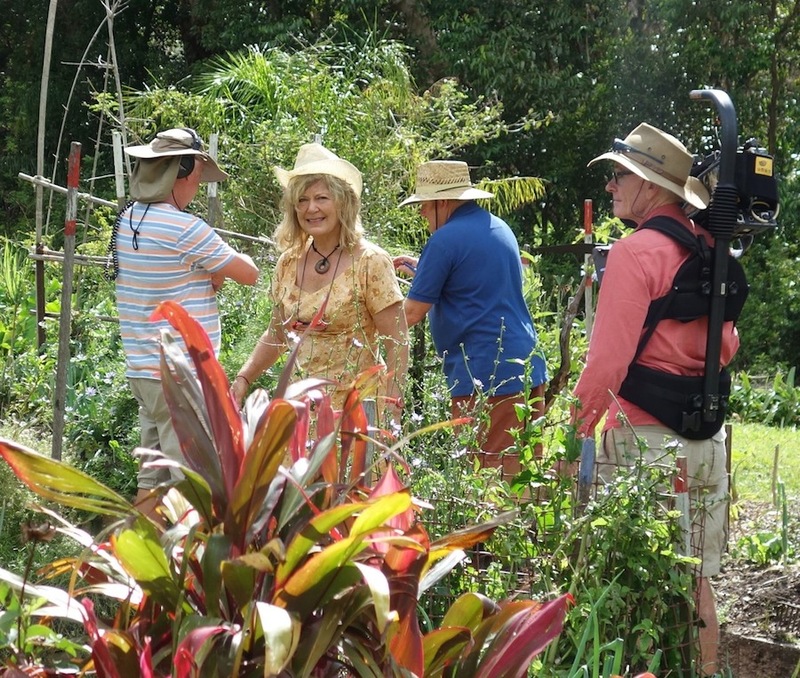 I am an active advocate and participate in Guerilla Gardening, having established the Brisbane wing of this international gardening movement. I am currently a patron of the Australia &amp; New Zealand Solar Energy Society.